On December 22nd, 2010, Leduc RCMP received a report of theft/fraudulent activity from the bank account of women residing in the Two Hills area. The women had been checking her bank account on line and realized that her account information had been skimmed and unknown suspect(s) withdrew funds from her account from an Automated Banking Machine located at the Save on Foods in St. Albert as well as Royal Bank in Leduc. Approximately $900.00 in total was taken from the victim’s account. 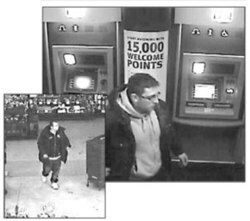 Leduc RCMP were immediately in contact with both locations and police were successful in obtaining surveillance images of individuals believed to be responsible for the theft and fraudulent activity. Leduc RCMP are continuing to investigate this matter and are confident that anyone knowing the suspect(s) involved would be able to identify the individual from the surveillance photographs attached. Anyone who has information about this offense or the individuals involved are asked to contact the Leduc RCMP at (780) 980-7267. If you wish to remain anonymous, you can provide your information through Crime Stoppers at 1-800-222-8477 (TIPS) or go online to www.tipsubmit.com.